The band also found a kindred spirit in producer John Congleton (Angel Olsen, St. Vincent), recording for two weeks at his Elmwood Studio in Dallas. It marked the band’s first time opening up their creative work to collaborate with someone outside of their DC-based community—a decidedly less hermetic approach. Priests found a third collaborator in bassist Alexandra Tyson, who has also joined the touring band. The songwriting process found the group once again analyzing the textures and scopes of albums as aggressive as they are introspective, like Massive Attack’s Mezzanine, Portishead’s Third, and Nine Inch Nails’ Downward Spiral. 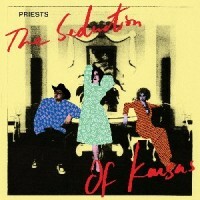 The first single, "The Seduction of Kansas," is Priests’ purest pop song to date. It is dark and glittering—though there is still something fantastically off about it, decadent and uneasy at once. Barry says: There is something inherently DC about Priests, displaying the gloomy syncopated rhythms of Fugazi or the minimalist charm and throbbing bass of The Evens, but with a hypnotic take on post-industrial rhythms and crescentic synth melodies. Unnervingly fluid in parts, skittering between 4/4 and 7/8 before launching into a soaring anthemic chorus. Brilliantly fresh sounding and completely addictive pop.